Playing math games with children can be a fun, developmentally appropriate way to spark understanding of big mathematical ideas. Math games also support children’s mathematical habits of mind—and key school readiness skills, such as problem solving, puzzling, and perseverance. When we watch and listen to how children play math games, we learn a lot about the mathematics they already know and what they’re ready to learn. This is the first article in a series about math games and how they support preschooler math readiness. What are dot card and finger games? Dot card games are simple and can be played again and again. They use cards that have one to 10 black dots arranged in different configurations—linear (straight line), rectangular, dice pattern, circular, and scattered configurations. A variety of dot arrangements help children develop different mental images of quantities. We often ask children to count a line of objects, but circular and scattered arrangements are harder to count one by one! These games support children’s ability to subitize—that is, to immediately see how many without counting, a key factor relating to young children’s math ability. Finger games promote children’s understanding of early math concepts, from counting to composing and decomposing number (the foundation of addition and subtraction). When children use their fingers to count, they are strengthening their number knowledge and their ability to visualize numbers in their minds. Finger games can be played anytime, anywhere, since your fingers are always with you! Here are some math games for children to enjoy using dot cards and fingers. Observe children as they play, and use the information in the “Things to notice as children play” sections of each game to learn more about the mathematics supported while children play these games. Now it’s time to play! Let’s start with dot card games. (See “Dot Card Games: Materials and Teacher Tips.”) Create dot card decks and gather the other materials. Check the teacher tips to learn how to challenge players as their math ability grows. And most important . . . encourage subitizing! Encourage children to quickly “see” how many dots are on the cards—particularly for cards with three or fewer dots. When children subitize and immediately “know” five dots, you might ask, “How did you see five dots so quickly? Did you group them?” Children do not need to count one by one for every card. If children always count one by one, they sometimes become less proficient at subitizing. You’ll find more than one version of each game. Focus on one-to-one correspondence and cardinality. Give each child one large dot card and some tokens (usually a few more than they need to cover the dots on the card). Ask children to count one-by-one as they cover each dot with a token. Give each child one large dot card, a blank 5 x 5 inch card, and some tokens (usually a few more than they need). Have children re-create their dot card using the tokens on the blank card. In Game 1, putting tokens on dots while counting reinforces one-to-one correspondence. Ask, “How many dots did you cover?” If children can tell you the total, they are beginning to understand cardinality. If they recount when you ask “How many?,” they may be still working on understanding cardinality. In Game 2, counting out the tokens to a certain number reinforces cardinality, and re-creating a configuration encourages children to pay attention to orientation and spacing (important early literacy skills). Focus on subitizing and comparing numbers. Game 1: How Many Do I Have? Place three to six dot cards on the table. Hold up a large dot card. Let children figure out the number of dots on the card, then match it to one of the cards on the table (the configuration can be different). As you play, use fewer words (or be silent), and have children simply match the number of dots on their cards to the number on your card. This game asks children to subitize or count the dots on the teacher’s card, then compare the number to their cards to find a match. You can have children show on their fingers or say aloud the number of dots on the teacher’s card before they find a match. Can you show me how many with your fingers? Do you know how many without counting one by one? How could we do it a different way? What is one more? What is one less? What strategy did you use? or What did you do when you got stuck? Focus on comparing numbers and vocabulary. For these games, place three to six dot cards on the table or give each child three to six cards. Game 1: Same? One More? One Less? Hold up a dot card. Game 2: I’m Thinking of a Number . . .
Say, “I’m thinking of the number . . . 2! Do you have a card with two dots?” (Just say the number, don’t show a card). Children point to (or hold up) their cards with the same number of dots (two dots). Game 3: Match My Number! Hold up a written numeral—for example, 3. 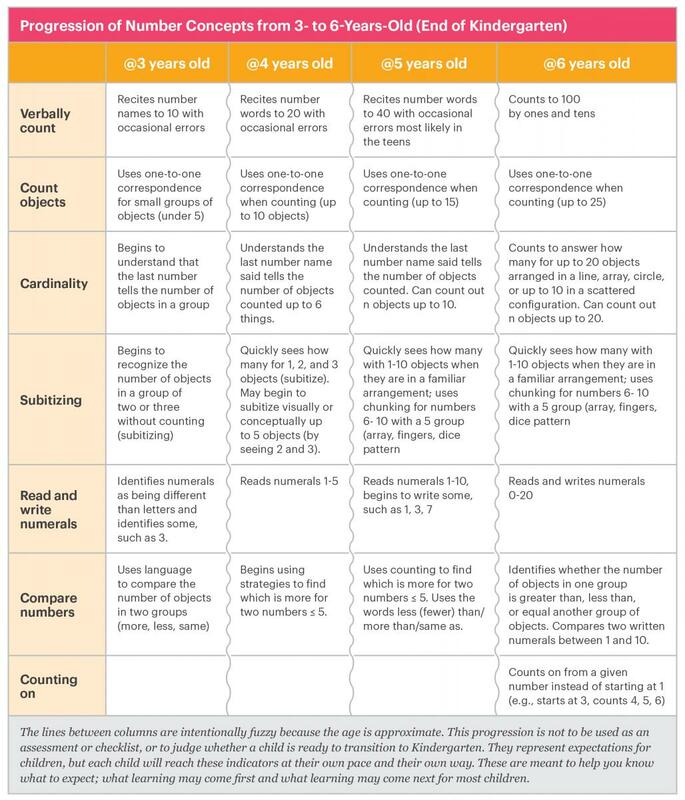 Talking about more, less, and same is critically important for building children’s math vocabulary and their understanding of the number line—especially knowing which numbers come before and after each other. When you show children a dot card, you are focusing their thinking on subitizing and recognizing quantity. When you say the number aloud, you are focusing on recognizing number names. When you show children a number card, you are focusing on recognizing numerals. Subitize at home. After dinner, grab a small handful of cereal and scatter the pieces on the table. Up to how many pieces can you recognize without counting? It’s more fun for adults than you might think. These finger games address the same math concepts as the dot card games. Children can have fun practicing their math skills in a new format. All that’s needed are fingers! Focus on subitizing and on composition and decomposition of numbers. Children can say three or show three with their fingers. Keep playing with different numbers of fingers, focusing on 1–5 and slowly moving up to 10. Vary how you show each number on your fingers. Game 2: Show Me . . . Hold up any number of fingers. Ask children to show you the same number on their fingers but in a different way. Hold up any number of fingers on your hands. Ask children to show you one more than you’re showing or one less. Game 4: How Old Are You? Ask a 4-year-old, “How old are you? Are you this age?” Hold up four fingers on one hand. Try this with other ages, too! The critical learning in this game is that numbers can be composed (or made) in different ways. You can make 5 with five fingers on one hand and zero on the other, or with four and one, or with three and two. These different combinations all make five. This helps children recognize that smaller numbers are part of larger numbers (e.g., 3 and 1 are two parts of 4). Make copies of the finger game instructions to send home with families. Print and send home math mini-books—find them at NAEYC.org/math-at-home. Cardinality. Children may count accurately (with one-to-one correspondence) but not yet recognize that the last number tells them the total amount. After children count a set of objects, ask, “How many do you have?” If they state the total number, they show an understanding of cardinality. If they recount the set, they may not understand cardinality yet. You can support cardinality by saying the total number after counting: “1, 2, 3. We have three pennies!” Another part of cardinality is counting out a specific number of objects (“Give me two tokens”). When counting out, children have to remember the number of tokens needed, count correctly, and know to stop when they reach that number. Composing and decomposing number. This refers to recognizing that numbers (or sets of objects) can be combined or separated to make other numbers. Children learn that a whole is made up of smaller parts and those parts are smaller than the whole. (If there are 4 paintbrushes and 3 are being used, only 1 paintbrush is left.) Preschoolers can recognize that smaller numbers are “hiding inside” larger numbers: 1 and 3 are hiding inside 4 (so are 2 and 2). Numeral recognition. 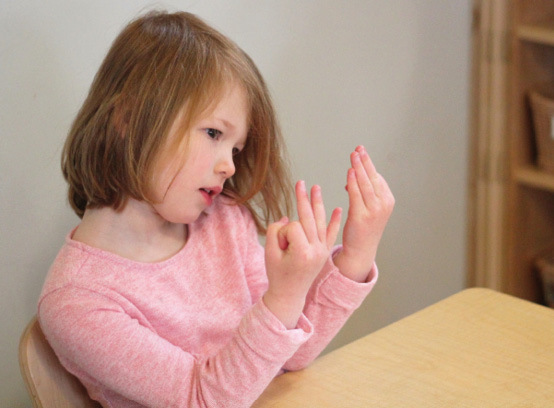 In preschool, children begin to connect what they are counting and how they are counting to written number symbols. They begin to understand how a quantity (number of blocks) relates to the number word (two) and to the written numeral (2). As children play dot card and finger games, you can bring these ideas together by pointing to a number line, number chart, or written numerals in your classroom. Encourage children to see written numerals as symbols to help them express what they are thinking and to easily communicate with others (writing 5 is quicker than drawing five blocks). Reciting number words in the correct order. Some children know the number words but may not say them in the correct order (1, 2, 6, 4, 5, 10). Others may skip a certain number (1, 2, 3, 5, 6—always skipping 4). The dot card and finger games give children opportunities to practice saying the number list (1, 2, 3, 4, 5, . . .) while counting dots on the cards or the fingers on their hands. Subitizing. This means instantly seeing how many in a small quantity. The word subitizing comes from the Latin word meaning suddenly. Children usually recognize 1 to 2 dots or fingers without counting “One, two.” But there are limits to what we see automatically. For larger quantities, we may cluster or chunk objects into smaller groups in order to know how many. In general, 8 dots are too many to see immediately as 8, but if they’re arranged so we can easily see them as two groups of four, and if we know that two 4s make 8, we instantly see 8. Circular and scattered objects are harder to subitize. This information has been adapted from Games for Young Mathematicians, a program of research in early mathematics at the Education Development Center (EDC), supported by funding from the National Science Foundation and Heising-Simons Foundation. For more math information and games, visit http://youngmathematicians.edc.org. Jessica Mercer Young is a research scientist and developmental and educational psychologist specializing in early learning at Education Development Center.